The Parks and Street Lights Office (PSLO) will hold a soil conditioner giveaway to promote the city government’s objective of creating a garden city. A total of 480 packs will be available for pickup. Applications for the soil conditioners are accepted starting Monday, September 17. According to PSLO, the soil conditioner is made from branches and leaves collected during the maintenance process of green spaces across the city. In addition, the agency also encourages the public to reutilize kitchen waste as natural manure to further the principles of reutilization and recycling. Fill out the Chinese application form which will be available on the Garden City website (https://farmcity.taipei/site/soil/soil_list) starting 10 AM on September 17, 2018. Only Citizens of Taipei City are eligible. Applicants must provide their real name and personal information. Each applicant can pick up a maximum of 1 soil conditioner unit. 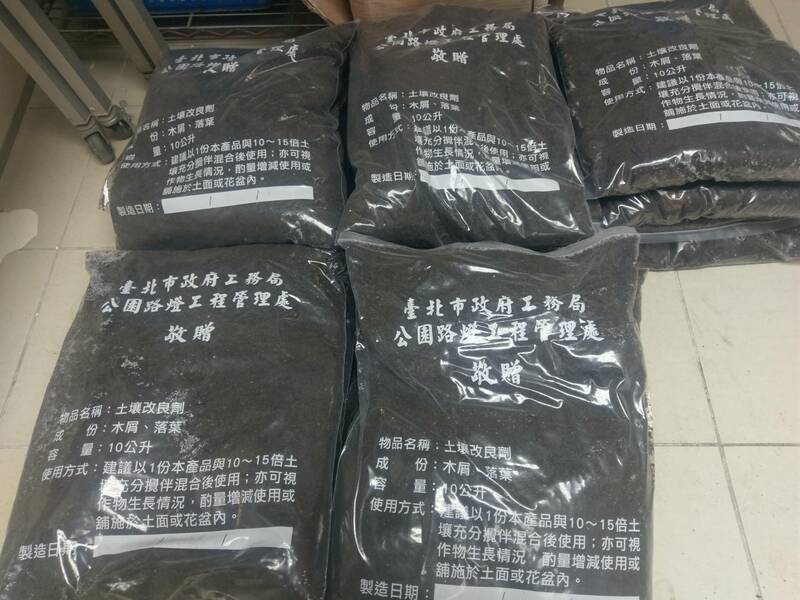 After application, check for the email dispatched by the Garden City website confirming the soil conditioner pickup. Bring your ID when picking up the item at the respective offices between 2 PM and 4 PM, September 25 through 28. Each bag contains roughly 10 liters of soil conditioner. The contents are placed inside a zipper bag, and offices will not provide additional bags for carrying. Applicants should bring their own bag or container.